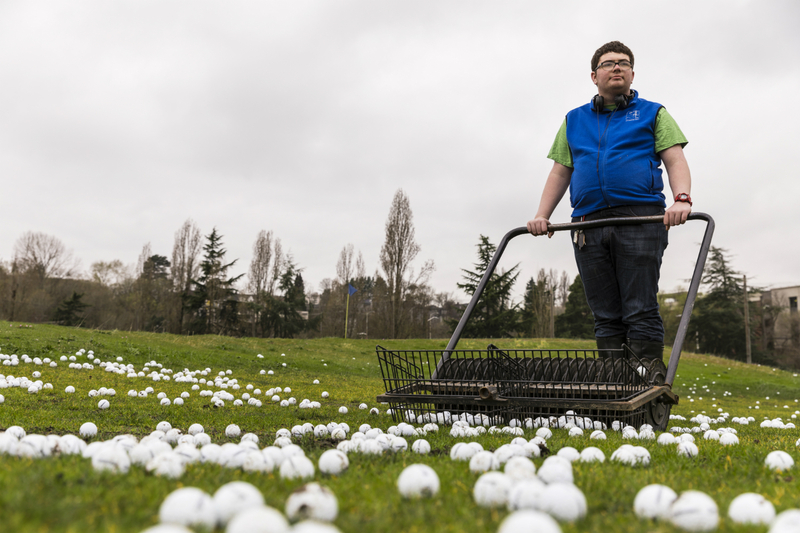 The sky is grey, the breeze is chilly, and Matthew Skelly, decked out in a fleece vest and work boots, is pushing a contraption called a picker around the University of Washington driving range. Hundreds, perhaps thousands, of golf balls polka-dot the field. 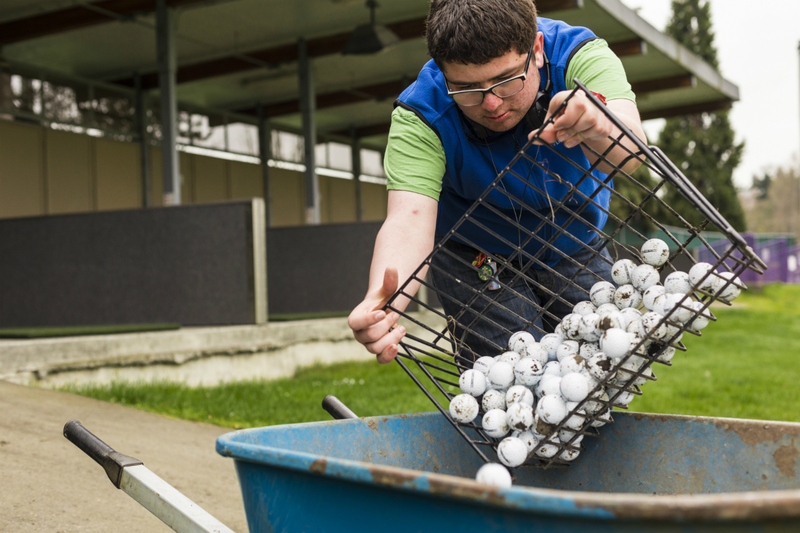 And four mornings a week, before the range opens, 21-year-old Skelly is one of two people assigned to collect them with the picker, a device like a push mower that traps the balls in its wheel and rolls them into a bucket. The picker squeaks as Skelly rolls it over the grass and through the mud, and sometimes he has to retrieve by hand the balls that miss its grab. By mid-morning, when folks show up with their clubs, he’ll have to move on to yard work. Skelly’s job at the driving range is an internship, his third this academic year, and he’s liked something about each of them: the responsibility of maintenance work at Transportation Services back in the fall, and, during winter quarter, the office environment of the Speech and Hearing Clinic, where he honed his ability to organize. The program’s three-internship structure has given Skelly, who is on the autism spectrum, skills that can translate to other jobs as he begins looking for full-time work later this spring. That’s the goal of Project SEARCH, a national initiative that is piloting its autism-focused, school-to-work model at the UW this academic year. At 10 locations on campus over the course of the year, the UW has hosted young adults with autism from the community in unpaid, part-time internships. 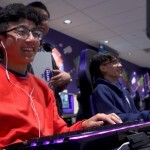 The program partners the UW with the state Division of Vocational Rehabilitation, Seattle Public Schools and PROVAIL, a local nonprofit that helps people with disabilities find jobs and gain life skills. Here at the UW, seven young men and women, all ages 20 or 21, are in the final quarter of their internship experience. Having received special education services through Seattle Public Schools, they are entitled, through age 21, to receive post-high school supports such as this from the district. Now, as the interns look to the future, one or two may pursue community college in the fall. A few talk of living independently someday. All hope to land a paying job, doing something they feel comfortable with and enjoy. For someone on the autism spectrum, finding and keeping a job can be a challenge. According to Drexel University’s 2015 National Autism Indicators Report, 58 percent of young adults on the spectrum — after high school, before their early 20s — have had a paying job outside the home. Project SEARCH, which started in the mid-1990s at Cincinnati Children’s Hospital Medical Center to improve the job prospects of people with developmental disabilities, launched a pilot study of an autism-focused approach at three sites on the East Coast in 2016 and expanded to the UW in 2017. Autism presents a unique set of circumstances, advocates say. 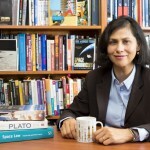 People on the spectrum often demonstrate an interest in or knack for a particular topic or job type, but they may need practice in some of the soft skills so critical to today’s workplaces: multitasking, adapting to new practices, joining a team environment, and recognizing conversational cues and other social norms. Universities can be tough sites to break into with a program like this, explained Project SEARCH’s Elizabeth Falk, because of their size, the requirements of various jobs and in some cases, the complications of contracts and vendors. The UW was chosen because of support from the university and its local partners, and because of its proximity to large technology companies such as Microsoft that have developed autism hiring programs of their own, Falk said. As part of the pilot, Falk is studying employment outcomes: what skills the interns acquired, how the host sites and partner agencies provided support, and whether interns ultimately found a paying job. Among people with autism, having a job produces both practical and less tangible results, said Dr. Gary Stobbe, director of UW Medicine’s Adult Autism Clinic. It’s helpful for other people in the workplace, too, Stobbe added, because they adapt. Fear and misunderstanding of differences erode. Rather than pushing people with autism to become something they’re not, how about meeting them halfway? “We need to embrace and welcome their differences, because differences can be a part of their skills,” he said. Seattle-based PROVAIL is the nonprofit agency charged with helping the Project SEARCH interns transition from high school to employment. The post-high school phase is critical to future success, said Michael Goodwill, the organization’s head of transition services. While special education students continue to receive support services from their school district, they can explore their job interests, thus increasing the odds of continued employment. Indeed, the National Autism Indicators Report shows that 90 percent of people with autism who worked during their teens went on to have a job in their 20s. “Schools and support systems are recognizing the value of making these opportunities happen for youth before they exit school. Our data show that retention is better when those systems get involved before students leave,” Goodwill said. Students participating in Project SEARCH have a support team that helps make for a smoother transition between school and workplace. “It’s bridging the gap between these big milestones in a person’s life,” Goodwill added. The liaisons with PROVAIL and Seattle Public Schools try to match the Project SEARCH internship with the person, their interests and challenges. They lead the interns in a group meeting every morning to discuss the day’s itinerary and upcoming tasks, and again in the afternoons to debrief. At the UW, interns start a new job each quarter to gain skills for and understanding of different work environments. Transportation Services assigned an intern to tackle maintenance at Central Plaza Garage; the Department of Communication needed someone to help check out camera equipment to students; and the Speech and Hearing Clinic needed an extra hand to inventory books for children, just to name a few. David Rahbee, director of orchestral activities and conductor of the UW Symphony, had his own long-planned project: creating a database of high school orchestra directors in Washington and nearby states. There was a Project SEARCH intern for that, too. When Rahbee first heard about Project SEARCH, he said, he wondered if his task would be appropriate. Then he talked to intern Alan Chen. “He showed he could do all of it,” Rahbee said. And more. 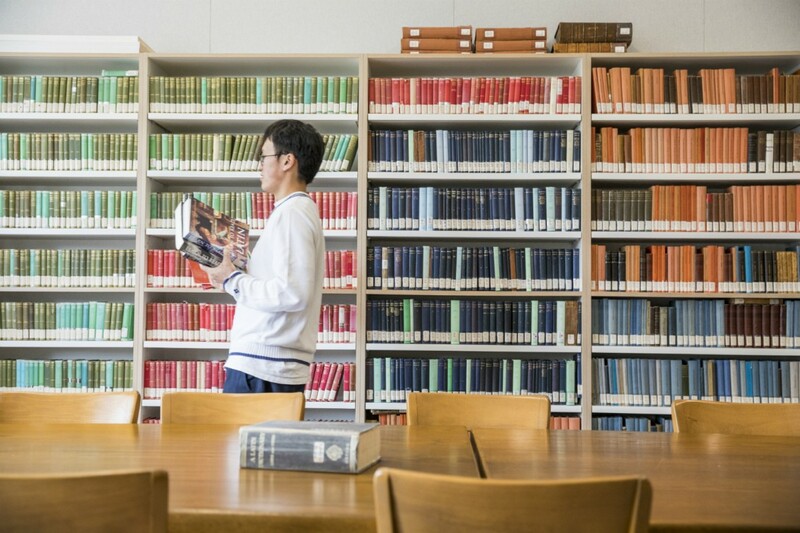 Chen, 20, managed the project mostly on his own and expanded it to six other western states. From there, he moved to other internships during winter and spring quarter — the first in the Department of Classics, the second in the Center for the Studies of Demography and Ecology. But he continued to work on a second database for Rahbee, this one of youth orchestras. Before the Speech and Hearing Clinic’s first intern arrived last fall, staff had a wish list of possible job tasks, which they were able to tailor to the intern’s strengths, clinic manager Julianne Siebens said. In the winter, when Matthew Skelly came aboard, the assignment went a slightly different direction, thanks to his data-entry skills. But coming up with plans was a fun challenge. “The key is to be flexible with expectations and willing to think creatively,” Siebens said. To Locke, the Speech and Hearing Sciences faculty member who serves as a liaison to Project SEARCH, the program helps improve diversity and inclusion on campus. Back at the driving range, Skelly considered how the program has helped him toward his ultimate career goal: flight attendant. He works part-time as a barista at a West Seattle Starbucks and, thanks to the UW internships, he’s learned what other opportunities are out there. He said he’s also figured out how he works, and what he likes: moving, not sitting, and interacting with other people. Customer service, really — something those who’ve worked with him at all his internships say he’s especially good at. It was nearing 10 a.m., so Skelly stepped inside and flipped the sign in the window to “open.” Time to get back to work. Project SEARCH is lining up internship sites at the UW for next school year. For more information, contact Locke at jjlocke@uw.edu or Cassondra Yi at PROVAIL, cassondray@provail.org.